Ecotherapy in Practice reflects the growing interest and research in this field. Drawing on a diversity of experience from the counselling and psychotherapy professions, but also from practitioners in community work, mental health and education, this book explores the exciting and innovative possibilities involved in practising outdoors. Caroline Brazier brings to bear her experience and knowledge as a psychotherapist, group worker and trainer over several decades to think about therapeutic work outdoors in all its forms. The book presents a model of ecotherapy based on principles drawn from Buddhist psychology and Western psychotherapy which focuses particularly on the relationship between person and environment at three levels, moving from the personal level of individual history to cultural influences, then finally to global circumstances, all of which condition mind-states and psychological wellbeing. Caroline Brazier is a psychotherapist in independent practice and course leader of the Tariki training programmes in psychotherapy and ecotherapy. A practising Buddhist, she is author of six previous books on Buddhism and psychotherapy. Having loved the outdoors since childhood, she has worked with groups and individuals in many different therapeutic, educational and community settings over the years. "The Ten Directions approach, as described in Caroline Brazier’s very helpful book Ecotherapy in Practice: A Buddhist Model, provides a useful framework for working in many different styles of outdoor healing, social or educational endeavors. This guide is a marvelous contribution to our field." 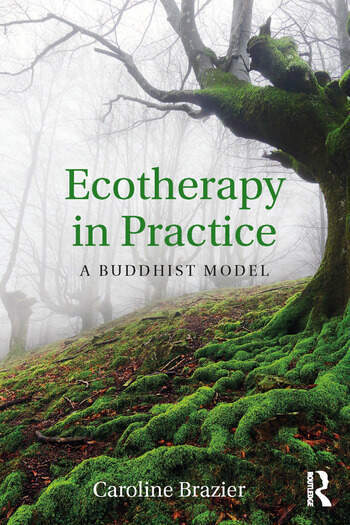 "In her book, Ecotherapy in Practice: A Buddhist Model, Brazier offers a new conceptual model for ecotherapy practice. This is intelligently woven together using ideas from Buddhism and the field of psychotherapy. Interspersed throughout the book is clear guidance for anyone wishing to work therapeutically outdoors. Brazier shows how Buddhism offers a natural home for ecotherapy with its teachings on mindfulness, presence, interconnectedness, reciprocity and the nature of change. This is a much needed practice as we head into climate change and global social unrest."